Every single card in the Tarot deck possesses a Numerological energy and vibrational frequency. As we know, Numerology is everywhere – it affects nearly every aspect of our lives. So of course, even the cards of the Tarot deck have an association with the science of Numerology, representing an energy of one of the cardinal numbers, a Master Number, or both! And the Numerology of the Tarot deck​ is incredibly intriguing. The Numerology of the Tarot deck​ is a little more complex than simply reading the number on one of the 78 cards in the deck. There are 22 cards in the Major Arcana, which are numbered from 0-21. These are the “trump” cards of the deck. Then we have the Minor Arcana, which is composed of 56 cards in four different “suits” that represent the four major elements – Wands (fire), Cups (water), Swords (air), and Pentacles (Earth). Each elemental suit has 14 cards each: 4 Court cards, (King, Queen, Knight, and Page), and 10 Pip cards, labeled Ace (1) to 10. The Court cards do not typically have a Numerological association, and the Pip cards are pretty straightforward as to their Numerological weight, (as long as you remember to also reduce 10 to 1). And the Major Arcana cards have obvious numbers attached to them as well. But as you can see from the chart below, there are some cards that will fall under multiple vibrations, (such as the Moon Card falling under Number 9 but also falling under the Number 18). This is because the Moon Card reduces to Number 9, but it also possesses the energy of both Number 1 and Number 8, which in turn adds a more specific meaning to that energy of Number 9. 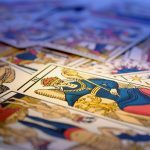 With this chart, you will also find links to the articles we have on the single-digit cardinal numbers, to better assist you in understanding the Numerology of the Tarot deck.